one + = 8 Required Please enter the correct value. Two Chinese Bitcoin exchanges, BTCTrade.com and BTC100.org, said early today that they had received notices from their banks that their accounts would be closed on April 15, just as earlier reports had suggested. While the largest Chinese Bitcoin exchange, BTC China, said it had not yet received any such notice from its banks (or the PBOC, for that matter), it appears now to be just a matter of time. It's just the latest move from Chinese authorities to curb what it considers dangerous speculation in the digital currency. The long descent of the Bitcoin price from its heights of more than $1,100 last fall started when the PBOC declared in mid-December that Chinese merchants could not accept the digital currency as payment for goods and services and instructed banks not to convert Bitcoin into yuan. Fears that the Chinese government will eventually ban Bitcoin outright have led many Chinese investors to abandon it. Volume at BTC China, for instance, is down 80% from its peak. "The people who are actively trading are few and far between," BTC China Chief Executive Officer Bobby Lee told PCWorld. "Certainly, the mainstream audience, if they ever get back in, is sitting on the sidelines." Lee said BTC China is trying to find ways it can still satisfy customers' desires to obtain Bitcoin without violating any of the new rules. The heads of other Chinese Bitcoin exchanges were similarly optimistic, despite the seemingly grave situation. "OK is always here, rumor-spreaders can leave now, we already have plans for April 15th," said OKCoin's Vice President He Yi. But even if the Chinese exchanges find a way to survive this latest blow, the implosion of the Chinese Bitcoin market will weigh down the Bitcoin price for months. But eventually, the Bitcoin price will rise again. the is creating the most wonderfull buying oppurtunity !!!!!! In your dreams lollypop. Bitcoin is on its way to the gutter with the rest of them (litecoin, dodgecoin, zetacoin). Not one of you will unencrypt wallets so the rest of us know bitcoin supporters are mostly crims nor tax cheats and the rest of us dont want to carry the likes of you. Don't be simple aliice, Bitcoin is an innovative and disruptive technology that isn't going anywhere. The whole "bitcoin supporters are mostly crims nor tax cheats" is so last year. Smart money is pouring/invested in by the 100's of millions to build out the infrastructure. Do you actually have a reason why it will fail? Besides reused buzzwords, like pyramid scheme and tulips, which they've been saying for years, and yet Bitcoin is still here. Buy you say? Better wait and see if you can follow the weird whims of the big Winklevoss twins who clearly are not intertested in the share markets seeing as they can pump and dump a whole lot of silly low class bitcoin fools who think they will make money in this ponzi scheme. Far more easy than moving the sharemarket markets, for the twins I would think, given they dont have the money of Goldman Sachs behind them, but if you think you can second guess the Wanklevoss brothers, well good luck with that one. There is a sucker born every minute and some of them buy bitcoins. Only time will tell, so proceed with caution while maximizing your potential. Why Bitcoin? If you are thinking of investing go for Zetacoin, it's going to blow up in the next few months and is x1000 cheaper than Bitcoin. The best part? ZET is x20 faster than Bitcoin and is being used as a mobile payment method right now (they have a super-fast app on Google Play). The payment app on Google Play will come pre-installed on all new smart-phone 2015/16 bought around Africa (lead developers in Kenya right now working on the small details). You can get Zetacoin via the major exchanges Cryptsy/Mintpal/Bter. Do an article about Zetacoin, I'm surprised how little PR they have! As long as the bitcoin ecosystem continues to thrive, bitcoin or cryptocurrencies in general aren't going anywhere. Everyday we see companies that are building innovate applications that foster decentralized financial systems and it's only going to get more competitive. 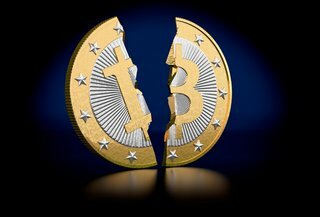 Companies like http://www.mintspare.com who offers their customers an easy way to own bitcoin by trading in their old or outdated electronics are just the tip of the iceberg. Stick around… 2014 will be a pivotal year for bitcoin regardless of the first two quarters play out.